Extra Large Time Management promotional wall calendar satisfies planning needs at a low cost. Applications are year to year business gift to keep your customers focused on your company. Features 80 lb. glossy stock, tinned top-bottom, large date blocks & very colorful styling. You MUST order calendars in lots of 50 units over the minimum qty. shown below. 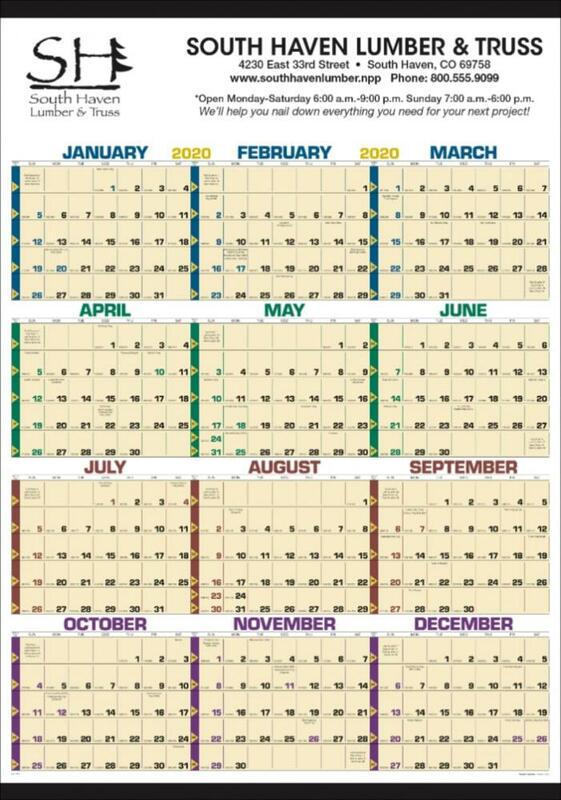 Overall size of the wall calendar is 27" wide x 38" high. Bulk packed in carton. For promotional wall calendars inserted into mailing tubes add $.55 each. Mailing Tubes are perfect to get your calendar across town or the USA. Delivery from date of order is usually 3 weeks thru Dec. 1 each year. This promotional item is proudly Made in the USA. Price includes Black Imprint in the center in an area 26" wide x 5 1/2" high. imprint logo and letters with a factory ready Illustrator eps or pdf file. Promotional Wall Calendars Optional Print Colors link above.